The Sinking Bell Tower of Laoag City in the province of Ilocos Norte is one of the first things you may spot upon entering the city proper. It’s a massive 45-meter bell tower said to be one of the tallest bell towers in the Philippines and was built by the Augustinians in 1612. The tower has earned its “sinking” reputation because it is so heavy and it was build on sandy foundations that it is sinking into the ground. Stories mention that a person on horseback could enter the tower with ease back when it was built. Now, a person of normal height has to bend down just to enter the vaulted entrance. The bell tower is part of the property of the St. William’s Cathedral 85 meters to the south (the long red-roofed building across the street in Google Maps). 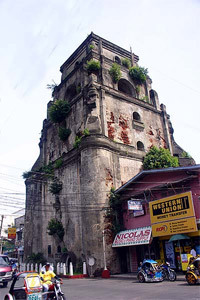 Just like the previously-featured Paoay Church also in Ilocos Norte, bell towers built during this era are physically separate from the main church building. But this sinking tower is the farthest I’ve seen from its church. Also, just like the Paoay Church, the bell tower has the same earthquake Baroque architecture typical of Ilocano Spanish buildings. If you want to learn just a little bit more, you should see this photo of the bell tower’s plaque installed by the Laoag City Sinking Tower Restoration Foundation. The tower is also pretty well-documented on the web.